Like many other states, New Jersey has adopted Dog Bite Laws to protect victims against unruly or aggressive attacks by dogs. These laws allow victims of dog bites to sue the animal’s owner for damages, medical bills, and pain and suffering as a result of the dog attack. If a dog bite occurs either in a public place, or on private property with permission or invitation, the dog’s owner is liable under the Dog Bite Law. The only two exceptions to this law are if the bite victim is illegally trespassing, or if the victim had incited or tormented the dog first, causing the dog to bite in self-defense. In New Jersey, dogs do not get a second bite. Once a dog has bitten someone, it is classified as a “potentially dangerous dog” and the owners must pay for registration, tagging, and tattooing of the animal as such. Owners of potentially dangerous dogs must then take extra precautions for prevention of further bites or attacks. 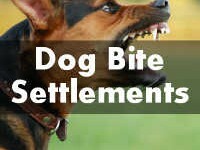 Due to the Dog Bite Laws in New Jersey, many court cases have been won or settled with large cash amounts awarded to the victims. In 2006, a dog bite attack on a guitarist in a band resulted in a $375,000 settlement. The guitarist was petting the dog, allowing him to lick his face, when the mixed-breed bit his nose and upper lip. He was treated in the emergency room for the wound to his nose and lip, which formed scars that had to be covered up during future performances. $2.1 Million was awarded to a New Jersey woman attacked by a pit bull. The woman had over $30,000 in medical bills, but the owner of the dog did not have insurance or any money to pay. Instead, the owner of the building was proven to be aware of the pit bull’s aggressive nature. Therefore, the building insurance company was forced by trial jury to pay the $2.1 Million award. In Princeton, a landscaper was bitten by a homeowner’s five German Shepherds while working on their lawn. Because the dogs were permitted to run loose on their property and the landscaper was there with permission, the case was settled out of court for $250,000. A grandmother protecting her infant granddaughter received a $495,000 settlement after a Newark dog bite attack. When the pit bull/German Shepherd mix went for the baby, the grandmother raised the baby high in her arms out of the reach of the dog. Instead, the dog bit the woman’s hip and thigh, only releasing his grip when someone bashed it with a shovel. The resulting injuries included torn, exposed muscle that required graphting surgery to repair. A New Jersey man received a $55,000 cash award after a dog bit him from the open rear cab of the dog owner’s truck. It was determined that the open nature of the truck bed, in addition to its height, facilitated the attack, thereby justifying that the auto insurance policy was responsible for the $55,000 payout. If you have questions about dog bite attacks and your legal rights, contact the skilled New Jersey dog bite attorneys at Personal Injury Law Firm of Jontathan F. Marshall. Call 877-450-8301 for a free consultation.